A recent article about the blatant nature of corruption in postmodern Alabama, especially among conservatives, points a glaring finger at Homewood attorney Rob Riley. That comes as no surprise, given that Riley -- ever since his father, former Gov. 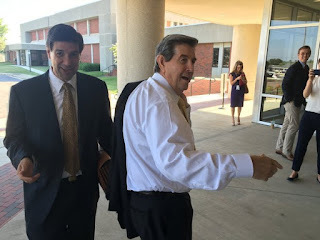 Bob Riley, rose to power in the U.S. House in the late 1990s -- has been tied to enough crookedness to fill several volumes of a series on modern sleaze in the Deep South. At one time, it seemed Riley and his brethren tried to be subtle about their oily ways. But in a recent piece at Alabama Political Reporter (APR), titled "Alabama politicians aren’t even trying to hide the corruption anymore," Josh Moon presents Rob Riley as a politician who does not give a flip if the public can see right through his shady dealings. This subject hits close to home for your humble blogger because I've seen Riley's shenanigans in an up-close-and-personal way. For an example, Moon turns to the 2018 race for Alabama attorney general, which might be the most interesting, underhanded, and blood-stained race on this year's docket. At the heart of Moon's saga is the sitting AG, Steve Marshall. Moon and Bill Britt reported at APR late last week that "Luv Guv" Robert Bentley appointed Marshall after receiving assurances that Marshall would investigate prosecutors Matt Hart and Van Davis in the Mike Hubbard case. This isn't anything new for Rob Riley. In 2013, he and lobbyist Liberty Duke filed a lawsuit against me, my wife, and Legal Schnauzer, claiming that reporting here about the Riley-Duke (ahem) relationship was false and defamatory. Did they ask for discovery, a jury trial, and money damages -- the normal course of a defamation lawsuit? Nope, they did not seek any of that. They went for a temporary restraining order (TRO) and preliminary injunction, both of which have been found to be unlawful prior restraints under more than 200 years of First Amendment law. It all was a scam designed to have me and Carol (who was not even involved with the blog at the time) unlawfully thrown in jail for "contempt of court." Their scheme was so transparent that I disclosed exactly what they were doing, even before I was arrested. Carol managed to elude capture and get the story of my kidnapping (arrest without a warrant) for blogging into the national press. Anyone slightly familiar with First Amendment law, especially the seminal case of Near v. Minnesota, 283 US 697 (1931), knew Riley, Duke, and specially appointed rogue judge Claud Neilson were operating way outside the law. In essence, Riley and Duke asked Neilson to act as a one-man censor -- and that has been prohibited, by law, for decades. In fact, that's why the law requires juries to hear defamation cases.
. . . 230 years of U.S. law shows Neilson's efforts to stifle a free press are unlawful. Riley's petition is a thinly veiled attempt to threaten my wife and me with jail for practicing journalism--the publishing of information that has not been found by any court to be defamatory. "When a newspaper or periodical is found to be "malicious, scandalous and defamatory," and is suppressed as such, resumption of publication is punishable as a contempt of court by fine or imprisonment. Thus, where a newspaper or periodical has been suppressed because of the circulation of charges against public officers of official misconduct, it would seem to be clear that the renewal of the publication of such charges would constitute a contempt and that the judgment would lay a permanent restraint upon the publisher, to escape which he must satisfy the court as to the character of a new publication. Whether he would be permitted again to publish matter deemed to be derogatory to the same or other public officers would depend upon the court's ruling." That passage describes exactly what Rob Riley is trying to pull--he wants to suppress a free press, with the threat of a contempt finding that is punishable by imprisonment. The U.S. Supreme Court in Near found "this is of the essence of censorship." It was unlawful in 1931, and it's unlawful in 2013. Marshall has indirectly hauled in tens of thousands of dollars in campaign contributions from Jimmy Rane and Will Brooke — two wealthy and prominent business owners, and major political donors, who were caught up in the Hubbard conviction. And here’s the fun backstory there: Rane and Brooke could technically still be indicted for their roles in giving Hubbard money. Of the 12 felony counts against Hubbard, two involved in Rane and Brooke. And with a grand jury still empaneled in Lee County . . .
Mike Hubbard is so guilty that Riley has to try to buy a reversal at appellate court. I've never heard of Rob Riley being a criminal defense lawyer. I haven't heard of him doing criminal-defense work either. Maybe that's why they are trying to buy the AG. If Marshall or Alice Martin are elected, it will be the same old, same old. What's with the delays on the Don Siegelman FOIA case and the Hubbard appeal? Just proves what Schnauzer has been saying for years -- our justice system is a sewer. Marshall specializes in letting GOP crooks off the hook. He did it with Bentley, and he's trying to do it with Hubbard. 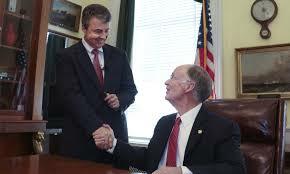 Marshall only got the AG appointment because he promised Bentley he'd go after prosecutors in the Hubbard case. Marshall has been a Bentley whore from day one. No word ever has better fit a political figure. Steve Marshall is as slimy as Luther Strange. I hear Marshall has some personal skeletons in his closet. I hear the same thing. Working on that story. The Rileys want to make sure Mike Hubbard doesn't sing. If he does, the Riley Machine is going down, down, down, down.